Hybrid Camera Revolution: Blackmagic Production Camera Shipping, Marked Down to $2995! Blackmagic Production Camera Shipping, Marked Down to $2995! Looks like Blackmagic got sick of the attention being lavished on the recently-announced 4K Panasonic GH4 - and decided to reclaim the spotlight by issuing some headline news of their own. In a press release this morning, Blackmagic Design announced that the long-awaited 4K Blackmagic Production Camera is now shipping - and that it would immediately be marked down by $1000 to $2995. 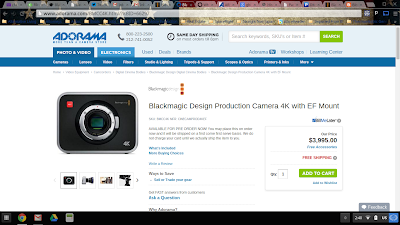 The new price is already reflected on the Blackmagic site - but was clearly not coordinated with resellers, because authorized retailers such as Adorama and B&H were still displaying the old price as of this morning. Even though months have passed since Blackmagic's promised shipping dates of "July 2013"; and "end of 4th Quarter 2013", this is very good news - and not only for those who have had their cameras on pre-order for months. Now (or as soon as these cameras start appearing in the hands of actual consumers), micro-budget filmmakers, documentarians and enthusiasts who want to shoot 4K have two relatively affordable cameras to choose from. I won't go into the pros and cons of each camera (Andrew Reid of eoshd did an excellent job of that in his recent piece, "Which 4K camera for the masses? GH4 vs Blackmagic Production Camera"), but, at $3K for the Blackmagic and $2K for the Panasonic, clearly, these cameras are revolutionary. So today, for the first time, anyone can buy a 4K camera for about what it costs to rent an Alexa for a week. These cameras don't have the Alexa's 14 stops of latitude, of course, but with these cameras, consumers and micro-budget professionals will be able to produce 2K (and in the GH4's case, 4K) images that are compliant with the Digital Cinema Initiative's Digital Cinema Specification for theatrical projection. As an aside, the Blackmagic and Sony "4K" cameras are actually "Ultra HD", recording at a maximum resolution of 3840x2160 - which is not DCI-compliant for 4K. The GH4 may not be able to output 12-bit 4:4:4 RAW - and it may only record 8-bit internally, but it is the only reasonably priced camera with the ability to record at the "True 4K" 4096x2160 resolution required by the Digital Cinema Specification. Why did I say "reasonably priced"? Well, the $12,000 Canon 1D C is DCI-compliant too - but you can buy six GH4s for that much money. All of that said, this is a great day for independent filmmakers - I look forward to seeing what shooters can do with an affordable 4K Super 35 cinema camera! 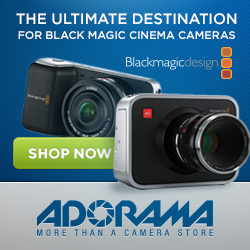 If you've been waiting for Blackmagic to announce a shipping date before ordering your Production Camera, please click on one of the links above or the display ad below (as soon as Adorama updates their prices, of course!). It won't cost you anything extra, and it will help to keep these blog posts coming. Thank you!